Mechanical keyboard with gold-plated contacts, cherry MX Brown switches, USB port, aluminium top plate and white LED backlight. Fans of mechanical keyboards will already know that Das Keyboard is the go-to place for high-quality devices that not only feature mechanical switches but are also pleasing on the eye. Introducing the Das Keyboard Prime 13  the newest member of the large Das Keyboard family. It takes full advantage of their years of experience in manufacturing keyboards in order to bring a new level of comfort and ease to the desks of writing maniacs. People looking for an excellent typing experience combined with the straightforward functionality of a keyboard will be delighted to find these priorities in the Prime 13. Beginning with the sleek and minimalistic exterior, all the way to the inner workings of the keys, it's obvious that programmers and copywriters alike will enjoy Das Keyboard's approach to a no-nonsense keyboard without surplus & unnecessary keys or questionable functions. 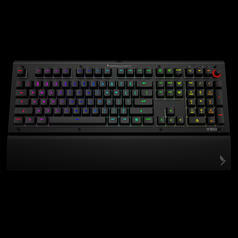 A first look at the Prime 13 immediately reveals that this keyboard is unlike most others. 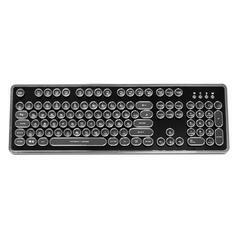 Instead of cheap plastic, the top panel is made of durable anodized aluminium and fits seamlessly into any working environment while protecting the keyboard from damage. Of course, that's far from all... In addition to the minimalistic and stylish design, the keyboard also features a well-thought-out cable management system: the 2-metre-long braided cable allows free positioning of the Prime 13  even on large desks, while the built-in pass-through USB port allows you to connect additional devices directly into the keyboard. Finally, the stressful installation of aftermarket cable management systems is a thing of the past! The most important thing to consider when it comes to a keyboard is, of course, the keys. 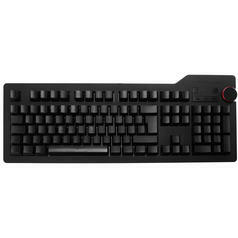 The Prime 13's keys are illuminated by white LEDs at 7 intensity levels and under the laser-etched keycaps you'll find those trusty high-quality Cherry MX Brown Switches. With an actuation force of 45 grams and a total travel distance of 4 mm, the switches provide a soft and tactile typing experience and will last for more than 50 million keystrokes. As you'd expect of a high-quality device like the Prime 13, the keyboard features a full n-key rollover, enabling the user to press multiple keys at the same time, all with extreme precision and reliability. 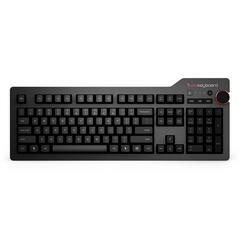 The Prime 13 is also the first Das Keyboard model to boast numerous comfort functions, like the shift of the labels of the media keys to the side of the keycaps to declutter and streamline the appearance of the keyboard. Another novelty is the built-in energy-saving function, which dims the backlight after ten minutes of inactivity and offers quick and easy access to the sleep mode to prevent unnecessary power consumption. The Das Keyboard Prime 13 is available in both US layout (104 keys), DE layout (105 keys), and UK layout (105 keys) and does not require any additional software or firmware, so it's compatible with most operating systems, including Windows, MacOS, ChromeOS and Linux. A keycap puller, for easy replacement of keycaps and cleaning of the keyboard, is also included. Das Keyboard Gaming Sling High-quality gaming sling with plenty of space for your gaming equipment. Key Cap Puller This tool helps you to exchange the keys of your mechanical keyboard. Key Sticker Tux This small sticker is 1.2cm x 1.2cm and fits perfectly to the windows-key of customary keyboards. Key Set for Mechanical Keyboards Geeky Linux exchange keys for mechanical keyboards with Cherry switches. Keys for Mechanical Keyboards WASD Sets Geeky gaming exchange keys for mechanical keyboards with Cherry switches. 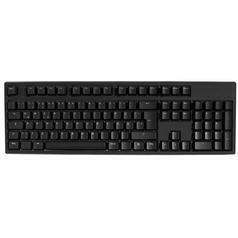 244,95 € lade... Code Keyboard V2B This mechanical keyboard focusses on the essential things and provides a clean design and high functionality. 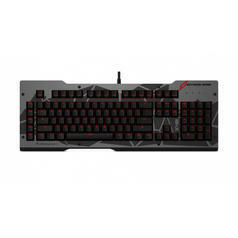 129,95 € 99,95 € lade... Das Keyboard Division Zero X40 Pro Gaming Now gamers can enjoy a mechanical keyboard that will survive even the most intense online battles without a scratch. 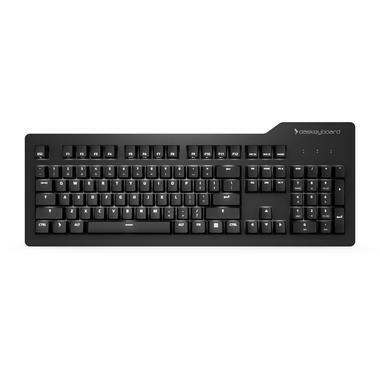 from 109,95 € lade... Nanoxia Ncore Retro Mechanical Keyboard High-quality retro-style keyboard with mechanical switches, round keycaps and a waterproof casing. 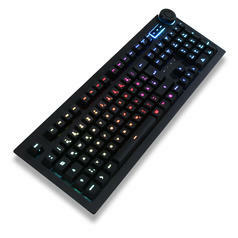 199,00 € lade... Das Keyboard X50Q Work, gaming and freely programmable keys with RGB lighting - this mechanical keyboard can do everything!